Two of my friends and I decided to go to Costa Rica. We were flying into the San Jose airport (which is actually located in the city of Alajuela), and then going to head to the beach in Samara. 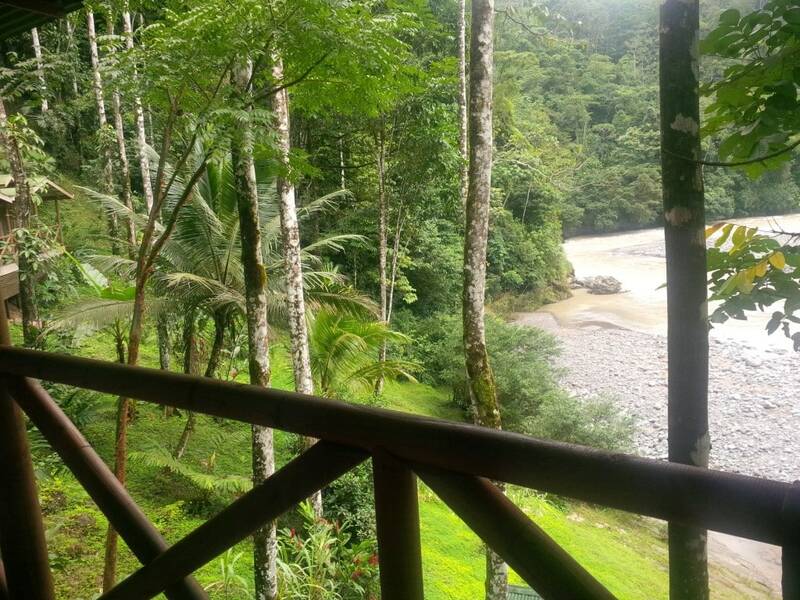 I did some research on the things to do on the Costa Rica Pacific coast and how much it costs to travel to Costa Rica. I came across some information on rafting trips and I thought that sounded fun. After some additional research, I settled on doing an overnight Rios Tropicales rafting trip. On the morning of our adventure, an English speaking guide picked us up at our hotel promptly at 5:30 am. The Holiday Inn Express, where we were staying, had packed us a nice little brown bag breakfast since we told them we were leaving before breakfast at the hotel would begin. The bus ride (although long) was excellent – the air-conditioning was plentiful and the roads were well maintained. 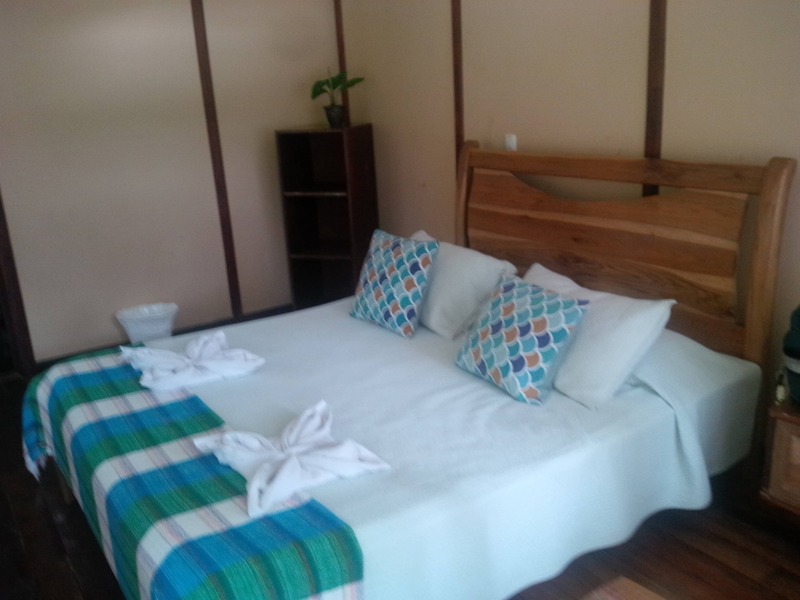 There were about 12 of us who were going on the Rios Tropicales river rafting trip‎ – although we were the only ones who were spending the night at the camp on the Pacuare river. We were able to learn about the cloudforest and the rainforest through the narration that was provided during the two-hour ride. Much of the area we went through was a national park with beautiful foliage. The guide mentioned that the water was high and that they had an alternative plan (another river) if it got to an unsafe level. Upon arriving at the headquarters, we had a hot breakfast and stored the luggage that we would not be taking on the overnight expedition. We saw a little red frog with blue legs while we were sitting. Our guide later told us it was called “blue jeans” because of its blue legs. We met our guide, Johnny, and found out that it would just be the three of us plus two guides on our raft. Then, we got back on the bus and on the way to the river were given an informative talk. I was pleasantly surprised at how much they valued safety. The talk was given both in English and Spanish since all of the guides spoke both languages fluently. We also learned there would be someone in a safety kayak in case anyone fell out of the raft. ‎On this second drive, we paused briefly as one of the guides spotted a rare King vulture, which can be identified by its white wings. Our guide then gave us our keys and showed us to our rooms. Our rooms were quite nice for a lodge and had both electricity (although no outlets) and running cold water. After settling in, we went to the bar to get a beer and then explored a bit. There were many waterfalls to see. One was across the river and could only be accessed by walking across the bridge. The bridge had a sign stating that the capacity was 14 people or two mules. Before we knew it, it was time for lunch. Our guides had cooked a hot lunch that included spaghetti with a tomato and ham sauce. We spent the afternoon hiking and seeing various waterfalls. We were supposed to do the ropes course, but it started pouring down rain. While we had received the safety talk and put on the gear, the ropes course excursion was postponed until the next morning. Our guide took us to another waterfall. There is an area near it that often is a fun watering hole. Unfortunately, it had rained so much that there was quite a current. Instead, Johnny helped us to climb to a few great spots for photos. We were told to meet back at the dining pavilion for happy hour followed by dinner. For happy hour, we had a very refreshing pina colada ‎made with delicious fresh fruit – almost like a fruit smoothie (what I said to myself to convince me ‎that it was healthy). As I enjoyed my cocktail, I watched our guides make us dinner. We had grilled tilapia, salad, mashed potatoes and steamed vegetables. For dessert, we had a ‎key lime pie bar. The mashed potatoes were made from scratch and were absolutely delicious. In fact, the entire meal was fantastic. It was quite impressive how great the food was considering the minimal kitchen and the fact that all of the food was brought in on rafts. Dinner was served buffet style and we ate by candlelight. It was a nice, relaxing conclusion to our evening. Since we had been picked up early that morning, we went to sleep shortly after dinner. We had been told that there were two plans for the next morning: one if it was raining and one if it was not. I did wake up in the middle of the night thinking it was raining only to realize that I was hearing the river. Since it was not raining, we had an early breakfast (consisting of eggs, sausage, rice and beans, watermelon, coffee, tea, and watermelon juice)‎. Then we geared up to go zip-lining. The zip-line course consisted of four lines. It was quite a hike to the beginning of the course, but it was so much fun to go flying through the trees! After zip-lining, we packed our bags and had a bit of time to kill before continuing down the river. The river was still high, but luckily had gone enough that it was safe for us to raft. We did some serious whitewater rafting including a couple of class III and IV rapids. It was so much fun! The time flew by, and before we knew it we were at the end of the trip. After getting the raft out of the river and retrieving our stuff from the dry bag, we got on the bus to head back to base camp. At base camp, we got our other luggage back. Although there were showers available there, I opted to wait since we were heading back to the Holiday Inn Express in Alajuela and I could shower there. Again, we boarded the bus to head back to the hotel. I quickly fell asleep and didn’t wake up until we arrived in San Jose. It ‎was rush hour and there was some serious traffic. We wound our way through the town dropping off people at various hotels. Eventually, we made our way to Alajuela and our stop at the Holiday Inn Express. I was so happy to be able to take a hot shower! After we freshened up a bit, we got a quick dinner across the street at the Rosti Pollo. ‎It was casual dining and the food was pretty tasty. I had the best michelada of the whole all week in Costa Rica (I became quite the michelada conisseur). A Costa Rican michelada is a refreshing beer cocktail of beer, lime juice and salt served over ice. (A Mexican michelada has additional ingredients.) The michelada at Rosti Pollo had the perfect amount of lime juice (I like them quite tart) and plenty of ice. After dinner, we again called it a night rather early. 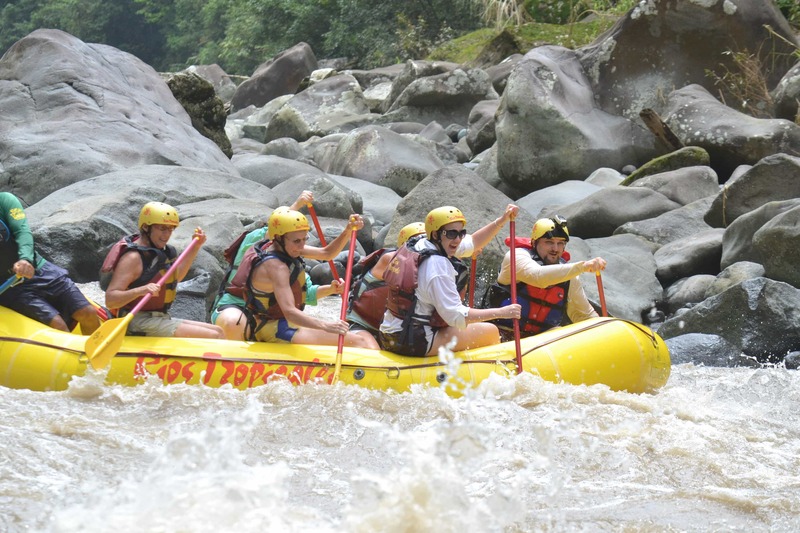 Have you done a river rafting or another adventure tour in Costa Rica? I would love to hear about your experience. Some hotels will prepare a brown bag breakfast if you tell them you will be leaving early in the morning. When packing for an overnight rafting trip, you should put everything in a small backpack. Everything must go in dry bags to be transported to the lodge. I packed one change of clothes, flip flops, pajamas, a swimsuit, my camera, a brush, toothbrush, lipstick, sunblock, and bug spray. Be flexible as the plans for the excursion may need to be adjusted based on the weather. Sit towards the back of the raft if you are worried about falling out. NextSt. Maarten/Martin Hiking Take Two!